We really wish there was more to say about the retail package of the HTC Amaze 4G. Unfortunately, all you’re going to find in it is a charger and a USB cable. Oh yes, there are some booklets as well and that’s about it. There are no headphones included in the box, nor a microSD card. What’s particularly bothering about this occurrence is that it is slowly becoming a trend not just with HTC, but other manufacturers. The first thing you feel the moment you take the HTC Amaze 4G in your hand is the cold metal. The smartphone is hands-down, one of the best made handsets in terms of materials and finish out there. It is a blend of aluminum, the HTC signature soft feel plastic, and Corning Gorilla Glass. The latter covers the entire front of the device, along with its edges which stick out about 1mm above the metal bezel on the side. The measures of the Amaze 4G are 130 x 65.6 x 11.8 mm, and its weight comes at 173 grams. The device is definitely hefty but, given the materials used on it, for a good reason. There surely will be plenty of people out there, willing to sacrifice weight for build quality. Just ask the Vertu crowd. Compared to its chipset relative, the T-Mobile Galaxy S II, the HTC Amaze 4G is slightly thicker and a lot heavier. Interestingly enough however, it is more pocket friendly due to its smaller screen. The Gorilla Glass covered 4.3” S-LCD display of the HTC Amaze 4G is already quite familiar to us. It is the same qHD (540 x 960 pixels) unit as in the HTC Sensation. The display performs well except when it is under direct sunlight. As you can notice in the picture above, the S-LCD unit of the Amaze 4G looks well on its own, but pales in comparison to the Galaxy S II’s Super AMOLED Plus unit. The viewing angles and contrast levels don’t come even close to the Samsung’s offering. The higher qHD resolution partially offsets this, but, we believe, a lot of people will be easily drawn to the Super AMOLED Plus screen. Above the screen, we have the proximity and ambient light sensors to the left of the earpiece and the VGA video call camera on the right. Under the earpiece grill hides a small status LED (on the right). It is interesting to note here, that the earpiece grille is flat, unlike what we have been seeing lately from HTC offerings. Underneath the screen, we find four capacitive keys. The haptic enabled controls are well spaced and very responsive. The keys (Home, Menu, back and search) have extra functionality upon a long-press (task switcher, virtual keyboard, voice search). On the left side of the Amaze 4G, you will find the uncovered microUSB port which is also used for charging of the battery. You can note how the screen is slightly elevated from the metal bezel of the handset. Things get much busier on the right side of the device. There, you will find the volume rocker, as well as the couple of dedicated camera buttons. The smaller one serves solely the camcorder. This is a welcome addition to the hardware department of the HTC Amaze 4G, and a drastic improvement over the lack of any hardware camera buttons in the case of the Sensation 4G. At the top we find the 3.5mm audio jack (left uncovered) and the Power/Lock key, which is easy enough to press when you want but secure against accidental taps. As usual, at the bottom of the phone, you will see the mouthpiece. There's also a small latch that lets you pop the phone out of its back cover. On the back of the smartphone, you will find the 8MP camera with its dual-LED flash right below it. The loudspeaker is also nested there – on the right side of the camera. The picture is on the back is completed by a lanyard eyelet. Under the phone’s cover is the place where some of the biggest changes in the HTC Amaze 4G, compared to the HTC Sensation took place. Remember the death grip issues which the latter had? They’re gone here thanks to the installation of the device’s antennas in the plastic parts of the back. This is actually the reason why plastic has been used in the phone’s body. The microSD card is hot-swappable as long as you have the back of the device removed. The SIM card is blocked by the battery. The HTC Amaze 4G packs a solid 1730 mAh battery. The phone lasted easily through a day of moderate use which included about an hour of phone calls and music playback, some web-browsing and video game play. In case you are a smartphone junkie like we are, we strongly suggest that you carry a charger with you. A second battery with a dedicated charger is also a neat option. 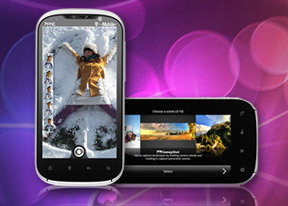 Overall, the HTC Amaze 4G is one of the most solid devices out there. It is so well put together, that it is easy to forget that the device goes a bit on the heavy side. Given the materials used, you can at least see where the weight has gone. The phone is easily distinguishable as an HTC device, which will be great for the brand’s loyal followers. The change in the design of the earpiece however, gives you a hint that what you are looking is new. The Amaze 4G felt great when held in hand. Once again, the credit for this goes to the premium materials used in the phone. We hope that the competition will take a note here.